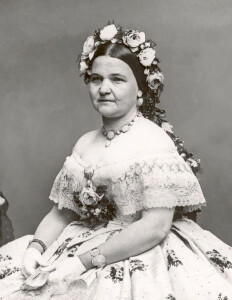 The wife of Abraham Lincoln (married on November 4, 1842), Mary Todd Lincoln endured the deaths of two of her sons in childhood (and a third as a young man), the emotional devastation of the Civil War (in which her half-brothers fought for the Confederacy), and the assassination of her husband. She was an unpopular First Lady, in part because of her Southern birth and in part because of her extravagant spending on clothing and furnishings. Like her husband, she suffered from bouts of severe depression. Her only surviving son, Robert Todd Lincoln, caused her commitment to an asylum in 1875. She was released after a court hearing in 1876, but believed herself to have been publicly humiliated. She fled to Europe, returning to Springfield, Illinois, in 1880, where she died three years later.